Passion stems from our most inner psyche. Most times we can’t explain it, and other times we try to justify it for the benefit of others. The unquestionable attraction to a specific type of car is much the same – it’s driven by passion. 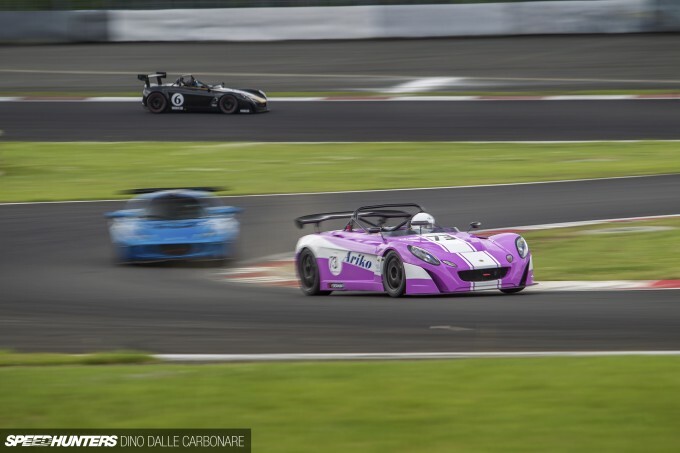 And if passion isn’t what makes the Japan Lotus Day so much better every single time it’s organized, I really don’t know what to put it down to. 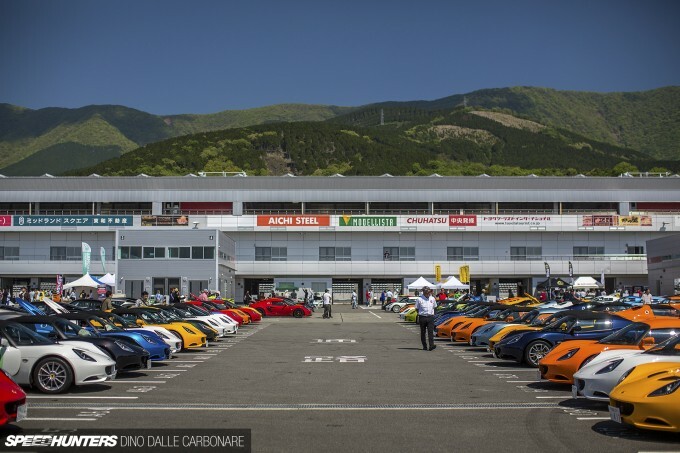 The Japanese love cars, and they love the right kind of cars. And honestly speaking, loving a Lotus as a brand isn’t too hard to do. 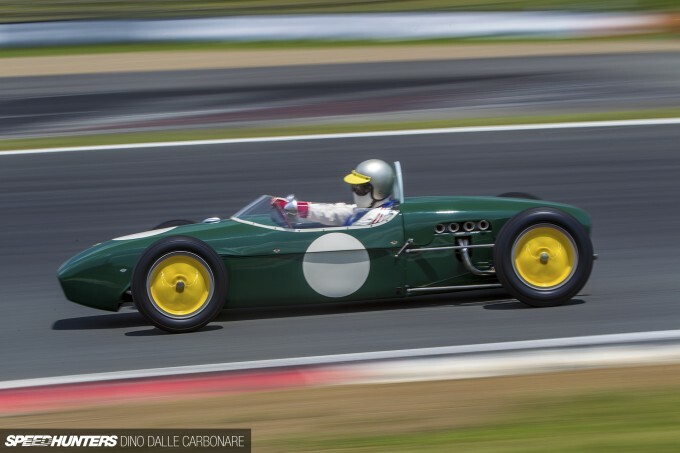 Through its history the brand has stayed true to its founder’s take on what a race and performance car should be, and despite lots of financial trouble, Lotus has managed to stay afloat, reinventing itself countless times and picking up even more passionate fans along the way. When you put pure driving satisfaction, feel and handling above all else, you know you are going to captivate the minds of those that put these qualities above attributes like raw power. 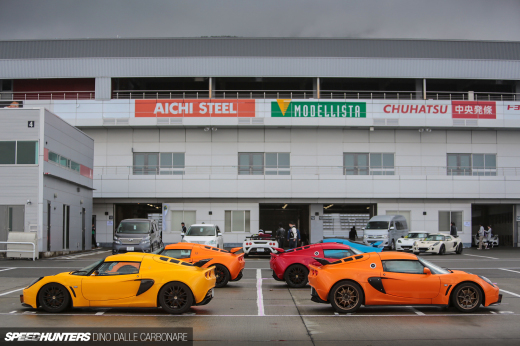 So is it surprising that in Japan the Lotus scene continues to grow? Absolutely not. 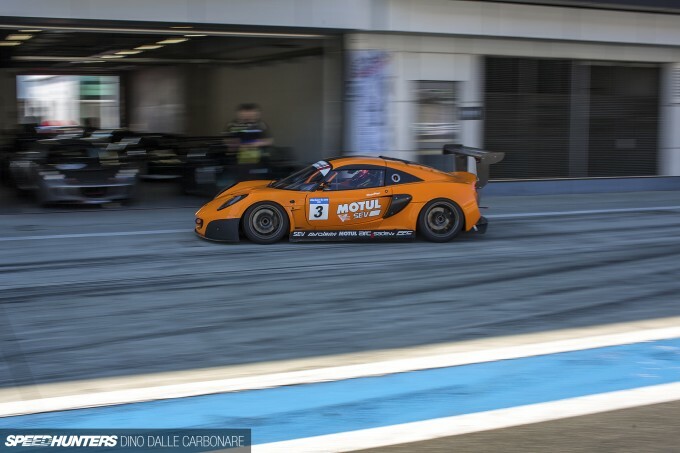 Lotus ownership is not only a way into a fun car, it’s also an opportunity to immerse yourself in a proper racing and motorsport experience. 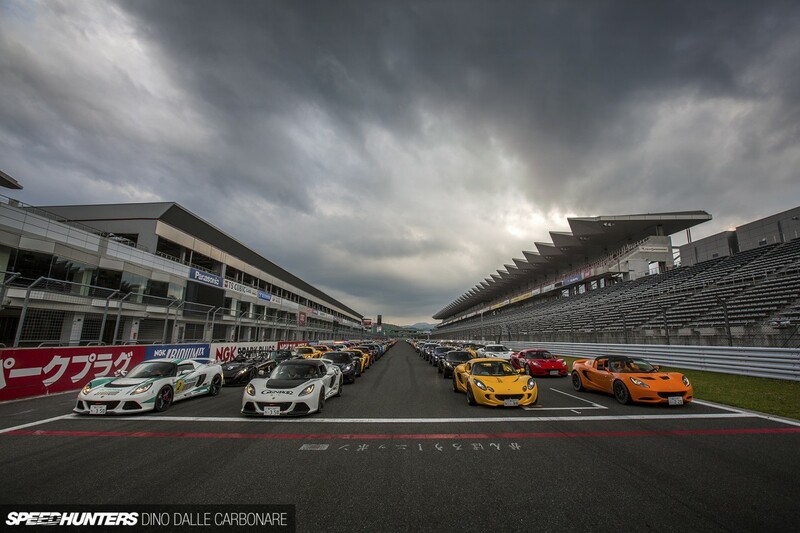 All of this is precisely why I had so much fun at Fuji Speedway last Sunday. It also served as a welcome change of pace and scenery from my usual Speedhunting ventures, allowing me to enjoy cars in a slightly different way. Like any day I venture to Fuji, it started off in the pits. Before an event officially even starts, I like to wander around, take in the sights and watch cars arrive and take their places in the pits and paddock. On this particular day it was also a good excuse to stay in the shade and avoid getting a nasty sunburn early in the morning! 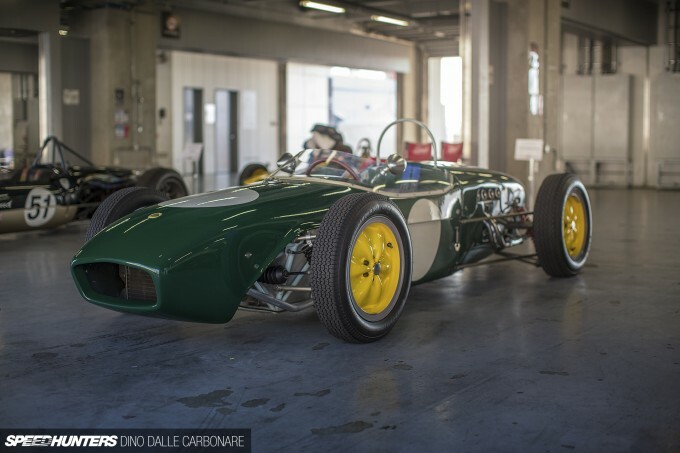 The pits quickly filled up with a wide variety of race-ready Lotus toys. 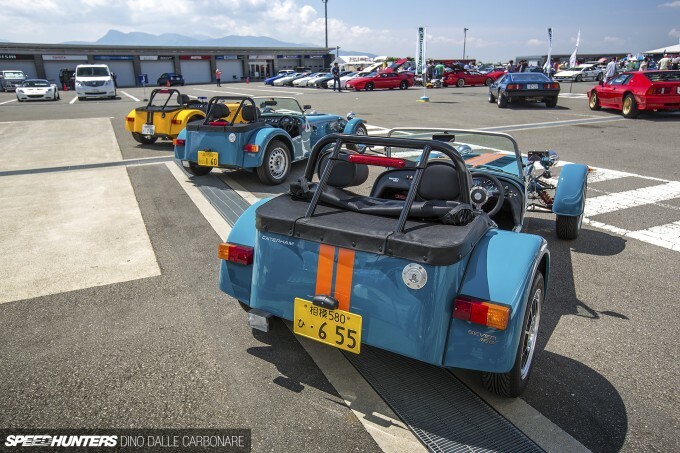 All models and generations of Elises and Exiges were present and accounted for, and ready to participate in the multitude of track outings that the event opens up to entrants. Despite Lotus being a British marque, strolling between the rows of cars it didn’t take long for me to be reminded that I was in Japan. It’s the way the Japanese modify their cars and only choose the best available parts that further emphasises their fanaticism for it all. But then again, the otaku-ness is strong regardless of which automotive scene you’re checking out in Japan! 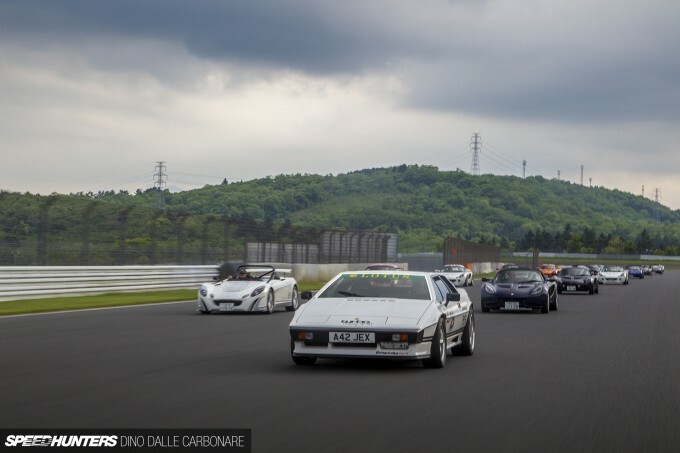 It’s pace-shifting events like these that refresh my outlook on the general carscape in Japan. Outside of the drifting, shakotan, time attack and RWB stuff I generally cover, I’m reminded that there is some really cool stuff out there. A perfect example is TiRacing, which I really have to get out to Chiba to do a shop tour on. I’ve been promising it for years now, but things always seem to get in the way. But after seeing one of their cars sitting in the pits with a beautiful air of functionality about it, it won me over, all over again. I did my best to move around and hit the track to check out the action. 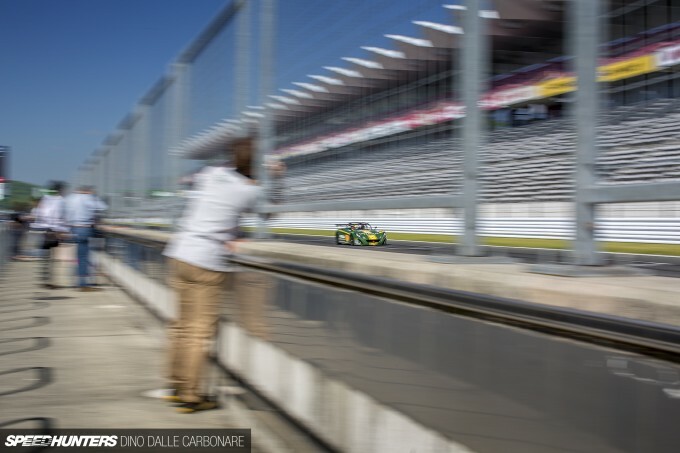 These Lotus guys were have a ton of fun throwing their cars around the technical layout at Fuji. Japanese Lotus owners are a pretty tight-knit bunch, hence why Japan’s official Lotus importer, LCI, is always able to bring out to the event some amazing historical racers, like this Type 35 from 1965. About 22 of these cars were produced and modified to enter a variety of series – from Formula 2 and 3 to American Formula B and C.
It certainly looked like nothing else I have ever shot out on this track. Poring over these old cars, you can’t help but wonder about how brave drivers used to be in this formative era of open-wheeled racers. 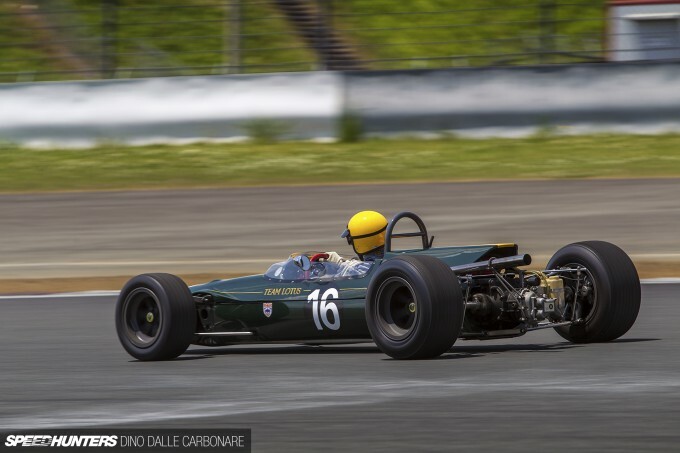 Obviously, they didn’t know any better, but despite Colin Chapman’s almost space-frame construction of this Type 18 for example, it looks rather flimsy by today’s standards. But that’s the beauty of it all. The romanticism that surrounds this Formula racer – a call-back to an era when racing was pure and beautifully simple – almost makes you want to jump in and take a drive just to tap into that feeling. 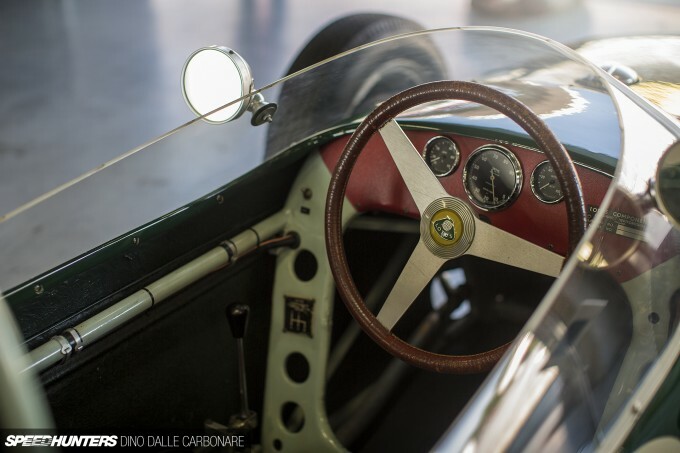 And that’s precisely why people collect these cars – to drive them and feel that connection with the past. 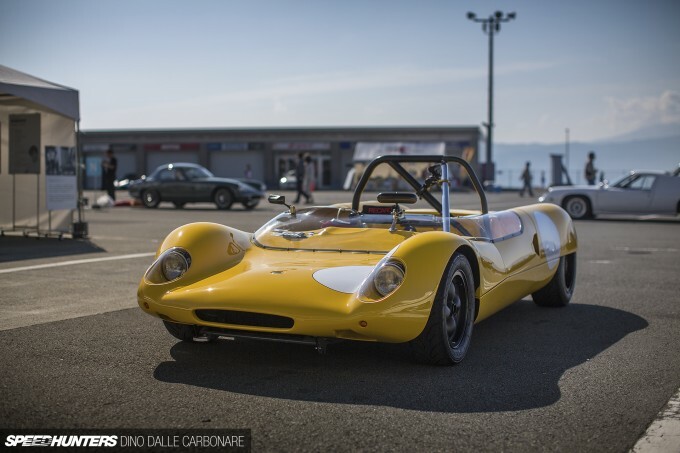 The Type 18 was Chapman’s first mid-engined car and in this particular Formula Junior version there’s a little 998cc Cosworth four cylinder engine powering the rear wheels. While I found it to be a thing of beauty up close in the pits, it was so much better to see it out on the black stuff being driven like it should. Oh, and don’t you just love the driver’s period-correct attire! 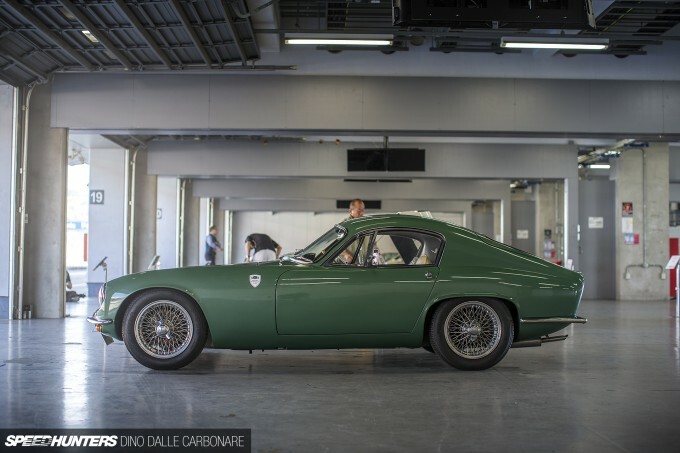 From another collection came this Lotus Elite fastback – the only one of its kind ever built. 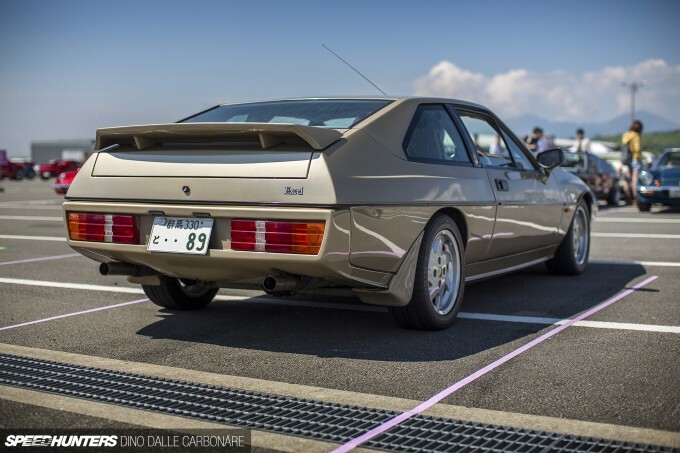 The Elite has one of the nicest histories in the Lotus lineage, but finished off with that fastback rear treatment, well, let’s just say there was much salivating going on around it throughout the day. Mounted quite far back in the front section of the chassis is an interestingly-named 1.2-litre Coventry Climax, which provides the 500 or so kilogram car with 105 roaring horses. 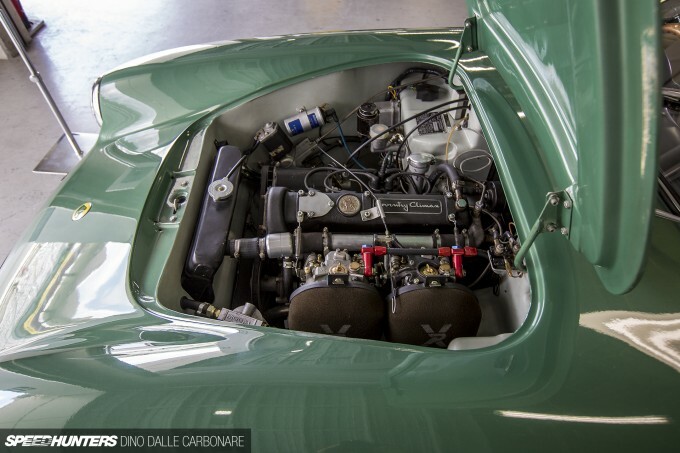 That’s like having 420hp in a 2-ton car, so it would have been very quick for 1963. 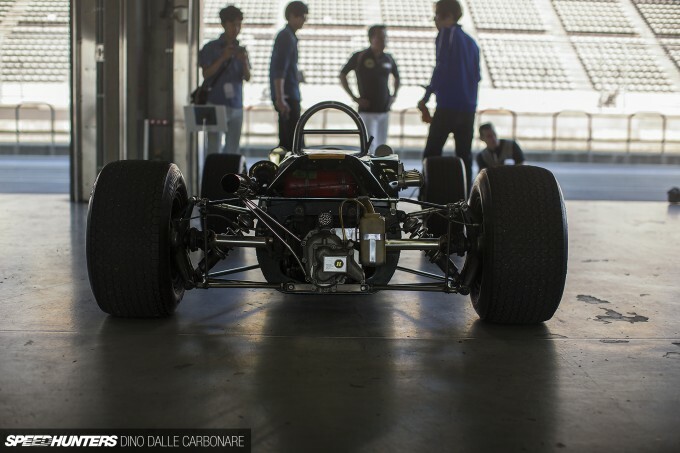 After spending far too much time being mesmerised by the metal (and fiberglass) in the pits, I came out to this view. There must have been 400-plus cars sitting in the paddock, and as you can see, flaunting quite a selection of catchy colours. People showed up with all sorts of vintage racers. One of my absolute favourites was this Mk1 Lotus Cortina. 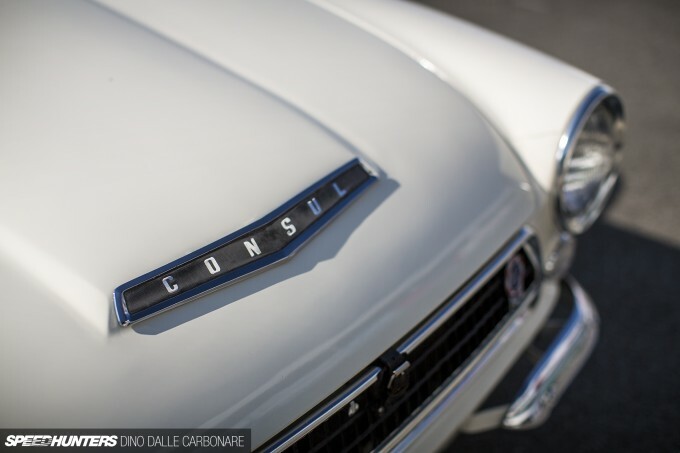 I have a thing for run-of-the-mill cars that are transformed into performance-oriented ones for motorsport homologation, and the Lotus-tuned Ford Consul Cortina was not only one of the first, but also one of the best. 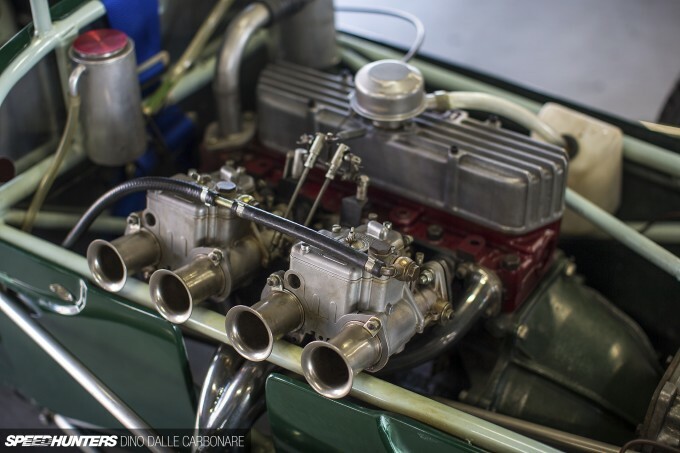 Fitted with a special 1557cc Kent engine that Lotus and Cosworth collaborated on to power the Elan, 1000 were needed to homologate the Cortina for Group 2. Lotus re-engineered the car giving it lightweight alloy body panels and completely redesigned front and rear suspension layouts. Some components, like the gearbox and diff housings, were even cast in lighter aluminium to shed weight. Not too far away was a ‘regular’ Elite coupé – a beautiful example that shows just how different the stock car looks in comparison to the bespoke fastback I showed you earlier. But let’s fast forward to the future and take a look at the only 340R that I spotted at the event. 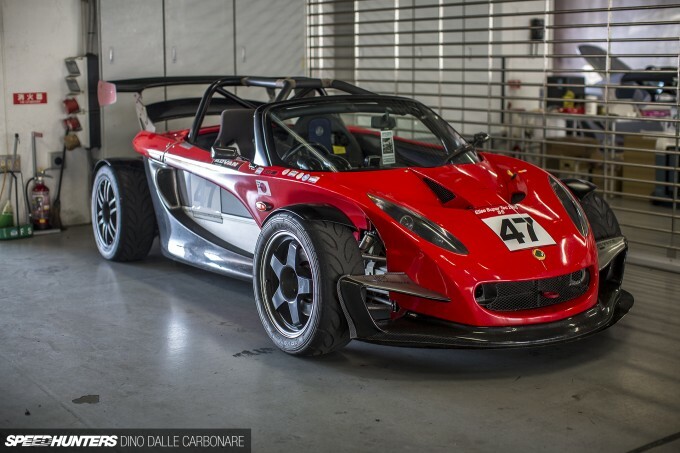 This is a car that Lotus built back in 2000 as a stripped-down special built on the Elise platform. It was cool just seeing one of the 340 cars ever made, but even better watching it being used properly! By mid-morning the action had really warmed up. There was barely a break and as soon as sessions ended a big line of cars were already lined up in pit lane waiting for the green light. It’s there that I spotted this crazy wide-body creation from BSK Performance. This custom one-off machine was built as a shop demo car, and it packs some pretty wild touches. I’m going to save all those details for a spotlight feature though, as I’m sure you’ll want to see more. In fact, BSK Performance surprised me the most at the Lotus Day this year, so I just had to spotlight two of their other cars as well! 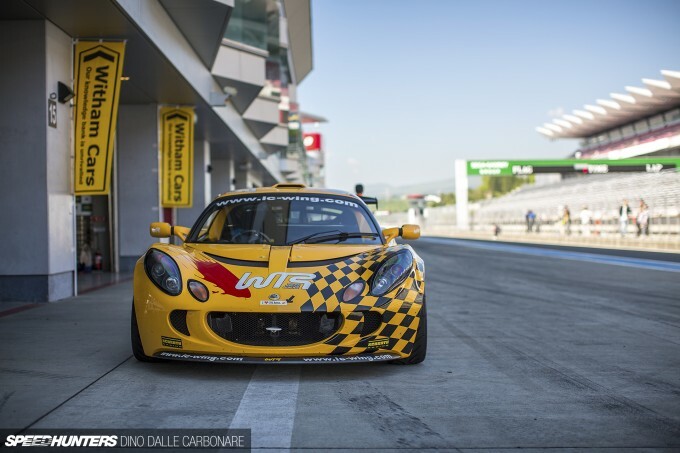 The level and lengths that some Lotus shops and owners go to in order to add a touch more speed and performance to their cars is quite impressive to see. 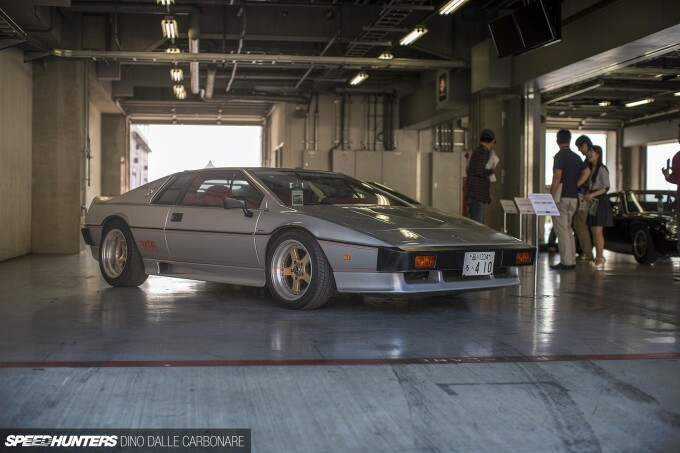 It’s the older gentleman that’s mostly captivated by the Lotus brand in Japan, so seeing that they’ll generally have a bit more spare cash to throw around than your average 20-something-year-old drifter, it’s not uncommon to see copious amounts of carbon fiber being used for aero and body parts, the odd engine swap and even sequential gearboxes. Japanese people crave quality, and in this scene it really shows. Giugiaro design anyone? 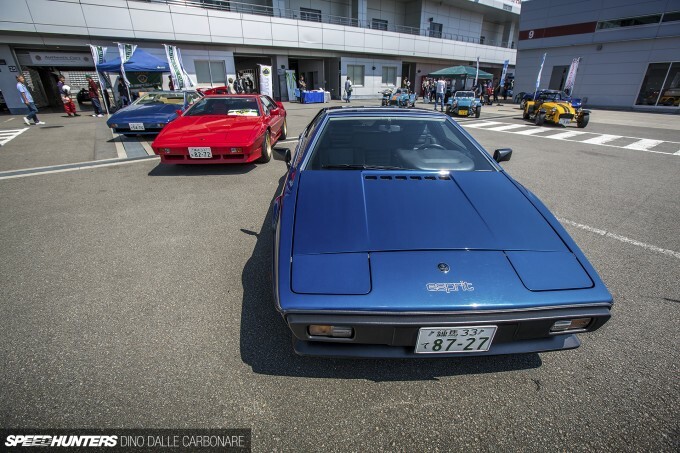 In my eyes the Esprit is one of the most beautiful cars that Lotus has ever made – but it has to be the earliest example possible, and perhaps sitting on some old period-correct BBS rims. Or how about the Excel? I remember seeing this particular car at past events, but it continues to draw me in. 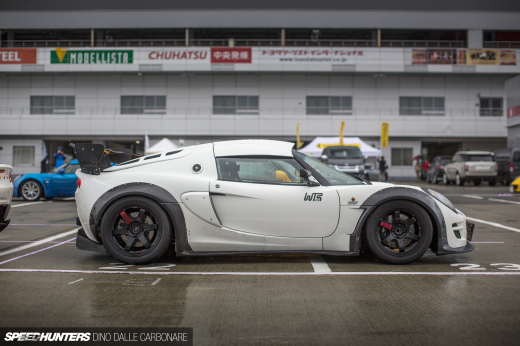 It’s not the prettiest-looking, nor the most successful Lotus, but it has something about it that’s just so right. 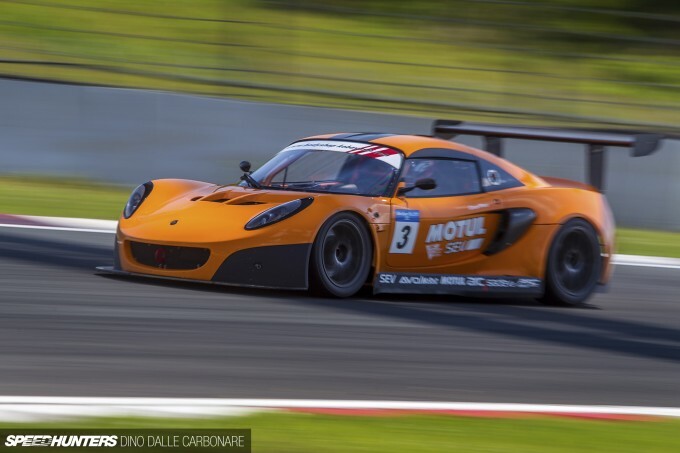 The event even included a round of the Lotus Cup Japan, which as of last year now includes the new-generation Exige S. That’s a car I drove last year and still vividly remember for the amazing driving experience it offered. As always, the day ended with a massive parade of all the cars out on track. 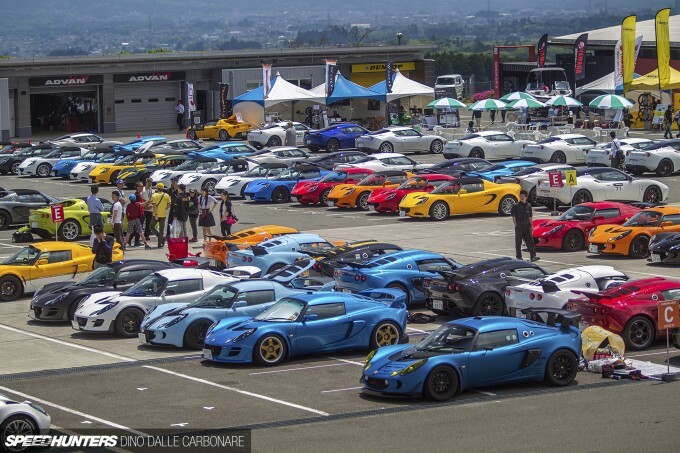 It was quite a sight, and a visual testament of how much of a following Lotus has in Japan. 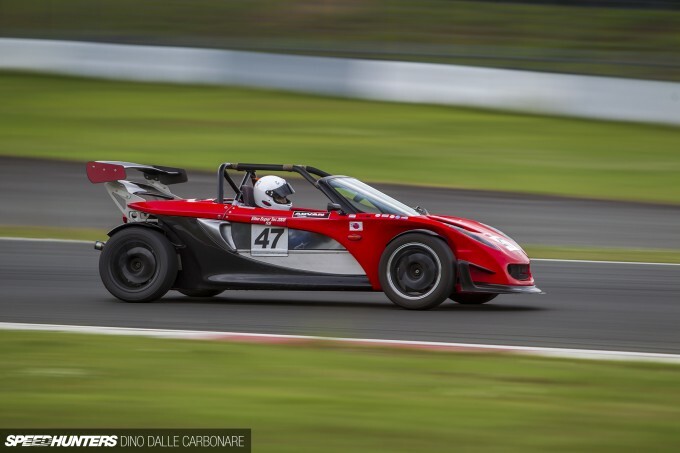 It’s the way that Lotus has stayed true to its philosophy for so many years that helps those into these cars form such a tight-knit community. And seeing it in a land so far away from the British countryside where these cars have always come from is nothing short of inspiring. 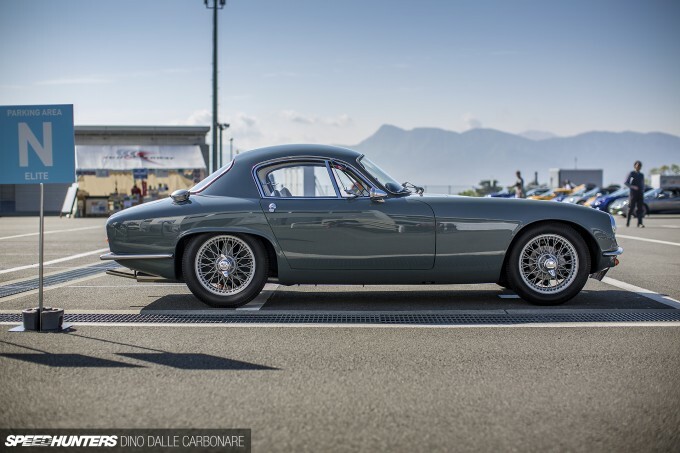 This is the first time I have heard of a Lotus Elite... I am in love with the Elan, but the Elite is just downright amazing. Lotus Day Japan is my favorite event, even though I have never been. I love seeing the Japanese take on tuning these wonderful cars. I have a Super Seven and always look forward to finding some inspiration in the coverage. Great Story Dino, now cough up the additional photos. DINO! I'm LOVING your motion shots recently. 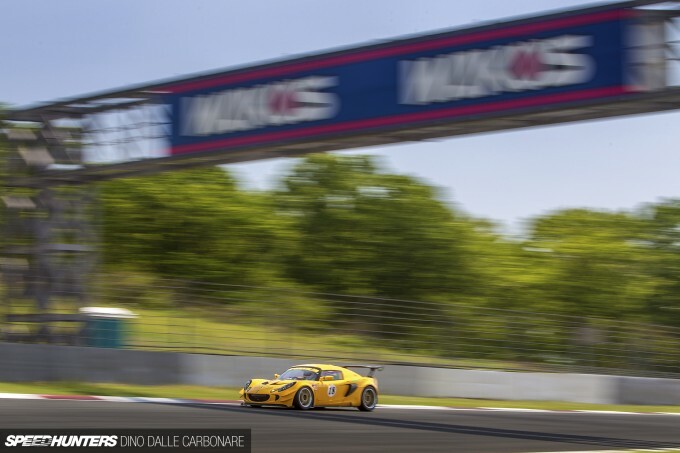 That yellow Exige blasting under the bridge? Amaze-balls. Just the front in tack-sharp focus, the rest blurred. It's going in desktop rotation along with the Hakosuka from your Sagamiko meet coverage a few weeks back. 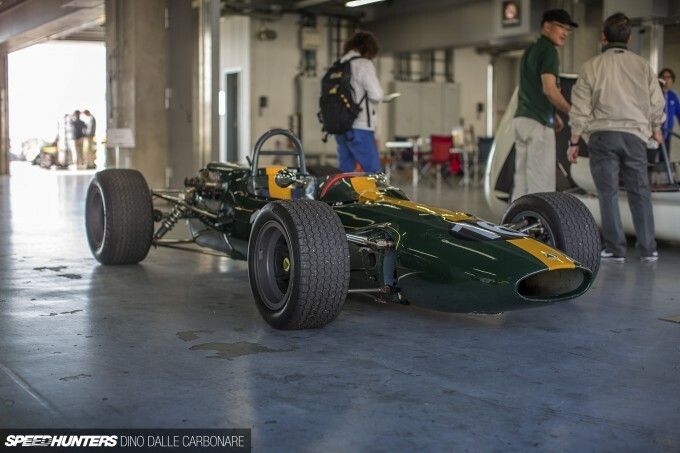 How much Horsepower had the old lotus Formula Cars? I'll settle for the BSK feature but I'm still waiting for the Ti Racing Outer Plus shop tour Dino!! Steve Hayward Haha thanks Steve! 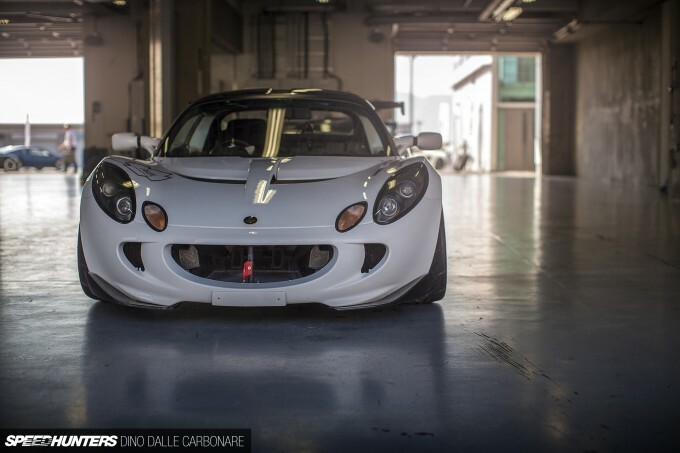 This post made me realise just how much I like the Lotus brand. The Lotus Cortina, Elan, Esprit, Elise, Exige, the old Eleven and modern 2- Eleven, the Formula 1 cars... so many great examples! Awesome Stuff as always! It was a pleasure working with you on this event! The late SOICHIRO HONDA's favorite car was the Lotus Elite. He actually owned one as well. If only the corporate brass of other manufacturers would embrace the true spirit of lightweight vehicle design. Well done Dino, you gave to these Lotus the pictures they deserve. The 2-Eleven... now that's one hell of car. For many people, gun title is primarily to offer protection. property, guns are regarded as being weapons that will secure and also save. That is why, many folks choose to own guns inside our homes and also offices. Cortina, Elan, Esprit, Elise, Exige, the old Eleven and modern 2- 11, the Formula 1 cars............. so many great examples! @DriveCircles Should make another one! superpern Thanks man, appreciate it! I managed to drop into Fuji only for a couple of hours last Sunday while on holiday so didn't get a chance to see all the cars! But you've summed everything about the event perfectly! Thanks for the coverage Dino! I love seeing esprits, they look so rad. Fordddddd gttttttt 2005 It's not about building something new, it's about make fast nible cars that aren't weighed down with useless crap. Loving the old models, disappointed not to catch even a glimpse of a Carlton! Absolutely incredible read that I have throughly recommended to all my Motorhead mates.